An event at its peak is down to preparative planning, powerful promotion and passionate people. Noticing a trend in our adjectives? 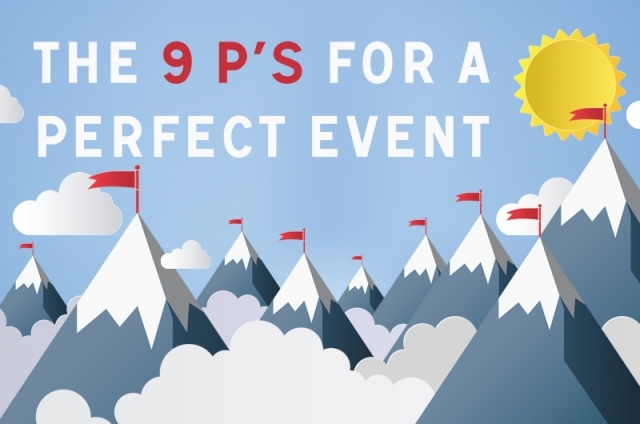 A perfect event success comes down to Nine P’s – read on to find out our recommendations! Perhaps an obvious “P” for any perfect event is Planning. When I first started out in the events industry, I was once told by my employer at that time that 20% of whatever I organised for an event would either probably not arrive on time or would change last minute due to a variety of factors beyond your control. Therefore it is important to have a plan B, where possible for such eventualities. Planning for the unplanned though is tricky, so a flexibility to react quickly and at short, together with a practical approach will help see you through. Building up a reliable network of third party suppliers you trust and who can help you out at short notice will also assist with troubleshooting. Pre-event marketing – Set your goals of what your pre-event marketing needs to achieve and monitor progress. For many, this is likely to include creating awareness and pushing ticket sales. Continue to create awareness and build anticipation leading up to your event by amplifying your event across all channels. This includes email marketing, social media, PR and your website. Promotion during the event – Regular live tweets, live blogs and live streaming will reach out to those in attendance and also to those who couldn’t make it, so keep these regular and relevant and your audience will be engaged. Post-event marketing – review what material you have collated during the event. Think about how you can package this to advertise and bolster the next one. Maybe this is an event showreel including photos, videos, stats, tweets and testimonials. People …help to shape any event. Whether you are booking crew for setting up, briefing venue staff, selecting staff and/or artists to work during the event, or inviting your audience, it’s imperative you know your people! Selecting the correct people will help to ensure your event runs smoothly. As well as being memorable (for all the right reasons) and professional. Listen to your people before, during and after every event. They will undoubtedly help shape and improve the next one! As an event planner, I would highly recommend booking a professional photographer to record your event from start to finish. Choose your photographer wisely though and one which comes highly recommended and backed up by relevant event experience. Ask to see their portfolio. A trained professional photographer will record every detail and record things you simply don’t see, or wouldn’t think to photograph. Photos can then be shared professionally to different networks of people such as local/national PR coverage, LinkedIn and websites to promote your event and engage with your wider audience. Smartphones will undoubtedly be used by your audience to capture those one-off memories created at your event. Give them a reason to share these through social media, whether this is through an organised competition or rewarding them in some way. Planning any event is both fun and rewarding, however, it can also be very stressful. To ease the burden of managing an event, delegate where you can and spread the workload with colleagues and people you trust to do the job well. Many hands do make light work! So take time in selecting the correct people for the task at hand and you will see the benefits. Ensure any concerns or foreseeable problems are dealt with swiftly and as soon as possible to avoid any looming problems resulting in potential headaches for you and your client. Event Coordinator was recently ranked as fifth most stressful job of 2017, according to Forbes. Therefor it’s important to take time out, both professionally and personally after each event. Evaluate the event as a whole and make time in your personal life to catch up on what you have missed, whilst you have been working long days or weekends in the lead up to your event. Constantly rushing from one job to another will do you no good in the long run. You will simply run the risk of burning out and will not perform to your best. Every event will have a set of objectives, so it’s important the event performs and achieves what it sets out to do. Closely monitor how an event is performing and don’t be afraid to change any element of it if you believe it is either under performing or, if it will benefit the performance of it. There’s a well-known phrase in the events world and it’s very true – “You’re only as good as your last event”, so performance is essential to ensure repeat business and gaining new business. Customers will remember a great event experience and will want to attend again next time. As long as it is priced correctly, perceived as good value for money and the customer satisfaction / experience is there. Trends and fashions come and go, however, customer satisfaction has remained constant and will continue to do so, so get this right and you’ll be on to a winner!